This installation at the Municipal Museum in Ustí nad Labem focuses on seed beads, a traditional commodity that has been traded throughout the world since the 17th century. The first seed beads were exported from Europe to North America and mainly used as a means of exchange for furs. Gradually, however, glass seed beads became part of a complex intercontinental trade network and were later exchanged for ivory and slaves destined for the American plantations. The installation gives an overview of the product, which continues to be produced in the Czech Republic today, then transported to South America for processing and, finally, transported back to Europe for use, declared as a “local cultural product”. of beads are made in Desná and Zásada and then exported each year. The main customers these days are bead shops and distributors in individual countries that sell on goods to their own customers. Seed beads are used throughout the world in traditional native products, souvenirs, fashion jewellery, clothing and household accessories, which are exported to various countries including the Czech Republic. One increasingly important area is the use of seed beads in hobbies, mainly in Europe, North America and Australia. These products, made in small batches or as original pieces, are bought by customers from all over the world over the Internet. Sometimes the designer and the producer is one and the same person; these creative talents sell their products, mainly fashion jewellery, through e-shops. Glass seed beads are a fine example of international trade that is mutually beneficial for both parties. A large part of global trade these days focuses on the export of commodities from less-developed countries, with multinational companies from advanced states earning money from their processing. However, seed beads from Jablonec were and still are used to make products with high added value in poorer countries, and they often help develop the local culture too. Therefore, they help people both here and on other continents to make a living and are a source of pleasure and entertainment for their customers. The installation is located in the Municipal Museum of Usti nad Labem in the main corridor alongside the installations NEWSeum and Gifts of the Sea. 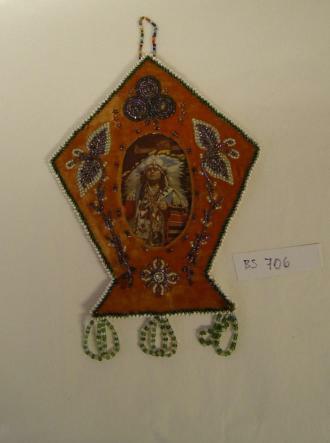 It is presented in an old-fashioned showcase, where small artefacts from seed beads are placed. Next to it is an interactive globe. Inside the vitrine are artefacts made from beads. 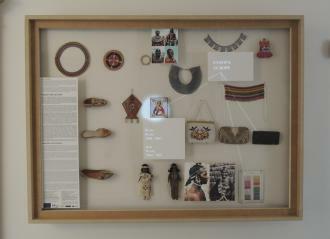 A second showcase is reserved for handmade artefacts made by workshop participants who were inspired by the original seed beads. The installation links to Millennium Development Goal 7 (“Ensure environmental sustainability”) and MDG 8 (“Global partnership for development”). The seed beads are very popular in many so-called developing countries, with many indigenous people using them to make their traditional ornaments or designs. Many of them use the beads to make souvenirs, clothes and jewellery. In the beginning, we wanted to show the relationship between local production and global trade. Since we planned to place the installation in the Museum of Usti nad Labem, we wanted to choose a topic that would have a connection to the installation’s surroundings. We chose between four typical products from North-West Bohemia – flat glass, china, crystal and seed beads. We discussed it with some experts from the Glass and Jewellery Museum in Jablonec nad Nisou and finally we chose the seed beads. This step took us about two weeks. As a next step, we had to gather information on the history of trade. We contacted an expert from the Glass and Jewellery Museum in Jablonec nad Nisou who prepared a large part of the installation and chose some museum artefacts to accompany the installation. After this we negotiated with the Municipal Museum in Usti nad Labem about setting up the installation in the museum. This second step took us about three weeks. After reaching an agreement with the Municipal Museum in Usti nad Labem, we contacted the artist Richard Loskot, who agreed to create the installation in line with our requirements. This step took us around five weeks. 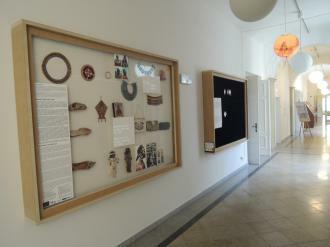 The fourth step was installing it in the Municipal Museum of Usti nad Labem, which took us about a week to complete. The artefacts are nice and interesting for visitors. The seed beads are a Czech artefact with a very interesting history and background. The museum environment prevented us from implementing some other ideas that we had planned. The contents of this publication are the sole responsibility of the Museo Mundial project partners and can in no way be taken to reflect the views of the European Union.